It is a bit hard to judge living in California (where ‘green’ is cool), but it seems that cloth diapering has been gaining more mainstream popularity with the development of modern cloth diapers (FuzziBunz , Bum Genius, G Diaper, etc). They caught my eye at a baby shower a few years ago. I was intrigued when I learned that folding, pinning, and soaking are no longer part of the equation. Despite the simplification and improvement of cloth diapers, the whole process can seem overwhelming. To help new moms be less apprehensive (with less to figure out!) - here's a list of recommendations and all the details about the process...especially washing. 6. Feel good about saving money, reducing waste, and how adorable your baby’s bum looks! I jumped into cloth diapering without knowing much. I was apprehensive to make the investment and the commitment, but decided less waste and less money would be worth any potential hassle. My son was six weeks old before I got up the courage to start cloth diapering. I expected to tolerate the cloth diapers, but I did not expect to love them. For me cloth diapering has changed from what I thought would be just one more chore into something I actually enjoy. Imagine that! Don’t be afraid - it isn’t as scary as it might sound. And no, you won’t have poop in your washing machine. Before we get into the details, a little word on the benefits - First, there is the obvious benefits of less waste from disposable diapers. Kids go through an astounding number of diapers from birth to potty training. Thinking about all those diapers in the landfills was almost sickening. This isn't the only benefit - cloth diapers are practical and economical in many other ways. Although the diapers require an up-front investment, the cost of the diapers is quickly recovered. There were days when my son went through 5 diapers in 20 minutes - thankfully that doesn’t last! Even assuming a much more conservative 6-8 diapers a day, the money savings are substantial! And if the diapers are used for multiple children (a benefit of getting durable high quality diapers) just think of the savings! Here is a model put together by Fuzzibunz about the cost savings. I’m not sure of the basic assumptions used to create this model, but it gets you thinking. As parents of newborns you dread the classic ‘poo-splosion’. I had numerous instances where the poop would practically shoot straight up the back of a disposable diaper. I can say with confidence I never once had poo leak out of my cloth diaper. And trust me - it was put to the test. 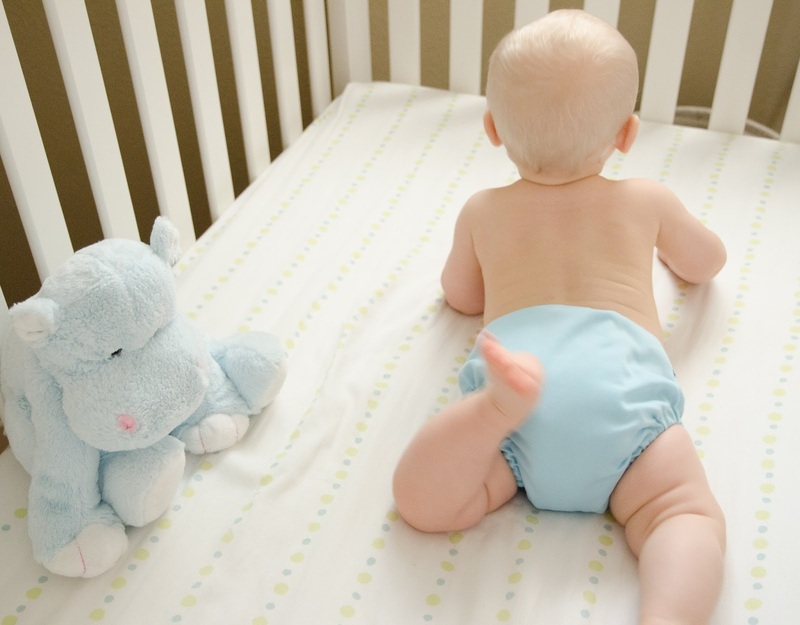 With natural materials and no chemicals, cloth diapers are also supposed to be better on a baby’s bum, reducing or getting rid of diaper rash. I’ve also heard that potty training is easier in cloth diapers. I have no experience here so I can’t really comment, but I am definitely hoping that is true. And finally, cloth diapers are ridiculously cute. So cute that I have decided to take my son’s monthly birthday photo with him in just his Fuzzibunz. How adorable is this? I’m sure I am forgetting some of the benefits, but do you really need more? The diapers - Which brand of diaper you choose is extremely important and very much based on what works for you and your child. It is often recommended to get a few different types and try them out before committing. This seems smart. I didn’t do this, but thankfully I couldn’t be happier with my choice so it didn’t matter. I have even had several friends try out multiple types of diapers and they all ended up with the ones I chose. Diaper Sprayer - Your new best friend. The right equipment makes a huge difference. GET A DIAPER SPRAYER. You might think it is optional - it is not. They make cleaning the poopy diapers SO much easier. When there is poop in the diaper you shake it into the toilet (where poop belongs - not in the trash) and you use the sprayer to rinse off what is left on the diaper. No dunking or soaking. No poopy diapers in your washer. Seriously. Get one. Without this I don’t think I would do cloth diapers. Diaper Pails/Hanging Bags - You need a place to keep the dirty diapers before washing. The best two options I have seen are PlanetWise hanging wet bags and the Fuzzibunz hanging wet pail. Both are lined with waterproof material and have zippers with wide openings so the diapers fall easily into the washer (no touching the dirty diapers). And the bags go straight into the wash with the diapers. Easy. I have two so I always have one available when the other is washing. I have not noticed a smell from the diaper pail, but if you are worried you can use the Rockin' Green Shake It Up freshener. The lavendar mint smells great:). Just throw these wool balls into the dryer with the inserts for chemical-free softening AND reduced drying time. Boom...magic. I use Woolzies. I’m a little partial to New Zealand wool. When I go out I keep a smaller wet bag in my baby bag to keep the diapers until I can get home and put them in the larger pail. The one from Fuzzibunz is nice in that it holds about 4 diapers (great for full days out). I also got a cute small Planet Wise one that holds about 2 diapers which is usually fine for shorter outings (they also make bigger ones). Again, good to have two or three so you always have one even when doing laundry. 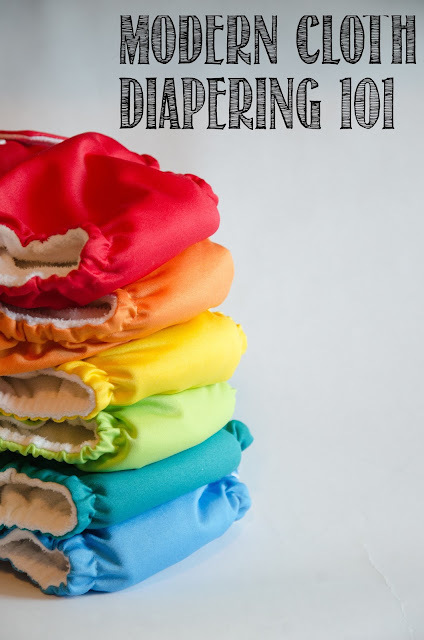 Cloth diapering is a lot easier (and less messy) than I expected, but proper care is very important to ensure your cloth diapers keep working well. Improper care can really ruin your investment. With cloth diapers, washing and detergents are SUPER important. Washing them incorrectly can make them leak. There are several recommended detergents. Here is a website that compares many of the options. It is very important to also check the recommendations of the manufacturer of your specific cloth diapers. We decided to use Country Save detergent. It is available on amazon in bulk and we split the four boxes with another couple. Recently we have also used Rockin' Green Soap and have loved it as well. I would not suggest the Fuzzibunz liquid detergents. I tried it and was disappointed. When removing the diaper, take out the insert and put it in the hanging pail. If the shell is poopy then shake the poop into the toilet if possible and spray off any residue into the toilet with the diaper sprayer. Put the shell in the hanging pail. When ready to wash, first do one short cold wash (or rinse) cycle with no detergent. Then do a normal hot cycle with detergent. Set your machine to complete 2 rinses after this cycle to get all the soap out. We want our diapers to last through a few kids so we have decided to be extra cautious and air dry the shells and the wet bags. When possible I will dry the shells in the sun to help keep them white. Sunning diapers is a great way to dry them and can help bleach them back to white if you have any discoloration (I have never had any problems). We do machine dry the inserts (with wool dryer balls). IMPORTANT: Do not use any fabric softeners in the dryer or washer with the diapers. It can cause repelling and leaking. Also don’t use diaper rash creams for the same reason. I have seen some rash creams advertised as cloth diaper safe if you really need them (like CJs butter), but I have no personal experience here. I use cloth diapers probably 95% of the time, but there are situations where I choose to use disposables. Don’t feel guilty if you use a few disposables here and there. You will find the balance that works for you. In general, I will say you have to pay more attention to the diaper ‘status’ than with disposables. I have on occasion left my son accidentally in a disposable until it was practically falling off it was so full with pee. This is obviously not healthy for him, but I was impressed at how much pee the disposable held. Cloth diapers hold plenty (especially if using both inserts), but they do have their limit. This does not result in me changing his diaper more frequently, it just means I can’t accidentally leave him in a diaper for 5 hours. And I have developed this funny ‘sixth sense’ for knowing when he needs a diaper change. Chalk that up to mom superpowers. I mentioned that I use a few disposables...approximately 8 a week. For example, I have decided to use 1 disposable diaper a night. Some have success with ‘double stuffing’ the diaper (using both inserts) for nights. I have tried this successfully in the past, but sleep is ever so precious and I didn't want to give my son ANY reason to wake up. We got into the pattern of using a disposable and it stuck. I do double stuff for his naps during the day and for extra long errand runs and it works great. I also attend a weekly mom’s group where nursery workers watch him. With changing nursery staff there is not an easy way for me to explain how to use cloth diapers. For these mornings we also use a disposable diaper. Many parents also work, raising the issue of daycare and cloth diapering. I am currently a stay at home mom, but many of my former coworkers have returned to work post-baby and are dealing with this issue. It seems that daycares are getting more familiar with cloth diapering - especially if you pre-stuff the pocket diapers. As you look for child care it is a great question to ask. Even if it isn’t possible, using cloth at home in the evenings and on weekends is still beneficial. A note on leaking - There are several issues that can cause leaking. If this is something that you struggle with I would suggest doing some troubleshooting to make sure it isn’t an issue with fit, washing, or compression. A note on cloth diapering newborns - I started my son in his cloth diapers around 6 weeks old so I don’t have experience trying to use them on a newborn. I have heard it can be done and will give it a try with the next baby. Finally, Feel good about saving money, reducing waste, and how adorable your baby’s bum looks! A huge thank you to my husband - he researched cloth diaper washing and developed our system while I was still in the post-delivery sleepless haze. Look for a future post on ‘How to Convince Your Husband to Cloth Diaper’ where my husband will share what won him over! Can't wait to see what else you have to share!